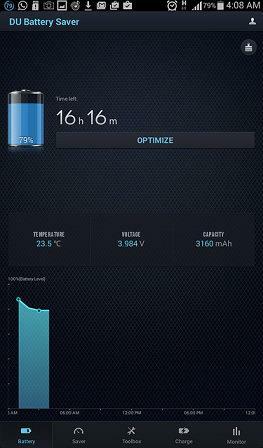 Are you looking for a battery saver for your smartphone? Do you have to frequently search for your phone charger? 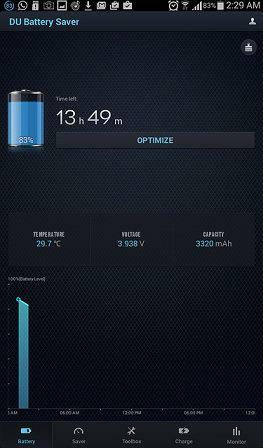 DU Battery Saver could help you with its intelligent energy saver features. The number one complaint among smartphone users is "not enough battery life"! We've all been there, desperately hugging the charger towards the end of the day to get some juice in to power up the Droid. My Samsung Galaxy Tab 3 lasts a little less than a day on full charge, and the DU Battery Saver/Power Doctor was offering up to 50% more battery life, so I thought why not? After all, every few minutes count when you're waiting for an important call or trying to watch that YouTube video that just can't wait till you get back home! Installing the app was easy. It's a small 6.2MB app that will download in less than a minute. This is the free version of the app, so it has limited features. 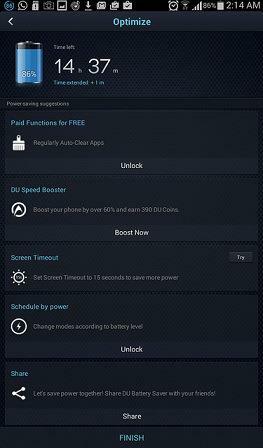 For the full features, you have to download the DU Battery Saver Pro. When it installed and opened for the first time, the app added a little 'Optimize' shortcut to my home screen. More about that later. Here is what the app looks like when it opens. It opens at the 'Battery' screen, one of its four sections, which shows me the charge on my battery, along with the number of hours remaining before it's time for the next charge. The screen also shows me the battery temperature (which has been between a healthy 20 degrees C to 31 degrees C for me depending on how aggressive my settings are), the voltage and my battery capacity. These are useful bits of information to have, especially when you want to put your battery through healthy charge cycles and prolong it's life as long as possible. There is also an area that displays the battery usage in the form of a graph, so you can see how your battery is performing over time. 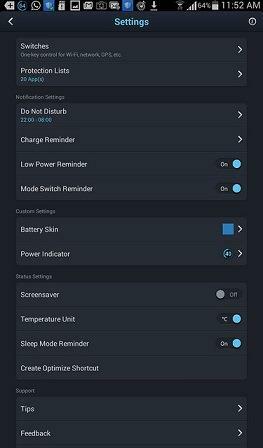 Hitting the profile silhouette icon in the top right-hand corner and then tapping the Settings wheel lets me manage features like Notification settings, Status settings and Custom settings for cosmetic elements like skins and power indicator icon types. Here I can choose whether to have low power reminders, charge reminders and mode switch reminders on. Additionally, I can turn on a screensaver, choose temperature units etc. This area allows you to set a protection list of apps that won't be switched off when 'optimizing'. There is also a support section with tips, feedback links and other info about the app, that I found quite useful. The Optimize button needs special mention here, as it is the main attraction of the app. There are two ways of getting to it. You could either run the app and tap on Optimize in the 'Battery' tab, or you could run the Optimize icon that the app installed on your home screen. The Optimize button scans through the background apps, sensors, brightness and other power-guzzling elements and removes programs running in the background. It tells you how many minutes have been saved by the process. It also gives you a list of other things you can do to save more juice, like clearing up trash with another DU app the Speed Booster, or or unlocking some paid features like Auto-clear for free by downloading a recommended app. In addition, you can share your results, shop for skins etc. from here. The app support section recommends that Optimize be used several times a day. 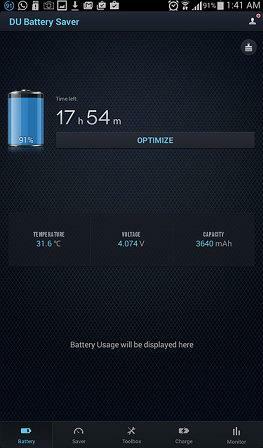 Optimizing can also be used in combination with the Saver modes to maximize battery life. The Saver tab takes you to a screen where you can select the mode you want your phone to run in. There are a couple of pre-set modes: Prolong, General, Sleep and My Mode. Calls and SMS are on in all the modes, but screen brightness, WiFi, Sync and Mobile Data statuses change among other things. You also have the option of adding your own custom mode for quick access. The tips on how to prolong your battery life is a useful addition. In the app's Charge tab, you will find brief information on Fast Charge, Full Charge and Trickle Charge concepts during your battery's charge cycle and how best to charge your Li-ion battery to help it retain its maximum capacity for longer. There is probably more you can do with this information with the Pro version. 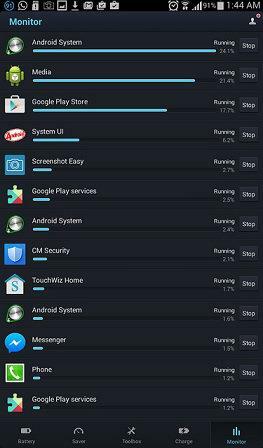 The Monitor tab lists a series of processes and apps that are running on my tablet and how much battery they are using. You can directly access your device manager for each of these processes by tapping on them. In the next screen you can decide what to do with the app – stop it, disable it, uninstall it or stop updates. 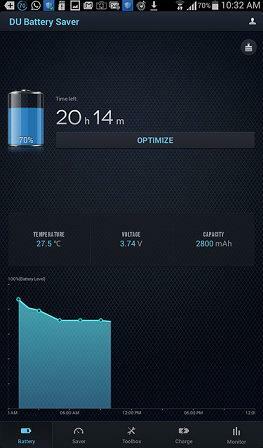 Testing the app is essentially finding out how Optimize helps to save charge and add minutes to your smartphone use. 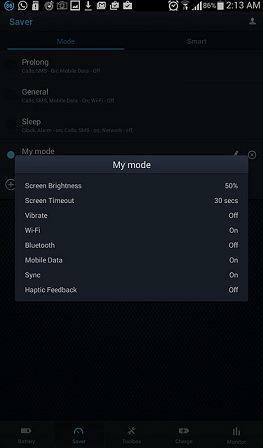 For the first two hours of use I let the app run at a default custom "My Mode", with brightness down to 50%, WiFi and Sync ON, vibrate, bluetooth OFF. After running Optimize several times in that period, the app finally saved me +1 minute on my battery by closing a background app. Now, this was not all that impressive, but over time I realized from the battery usage graph that there was a significant easing of the usage curve. I managed to save an hour over a period of an hour with the custom mode and optimizing once in that time. The curve became even less steep (meaning less battery usage) when I switched to the General Mode after another hour, with screen brightness down to 10% and WiFi off, and found that I saved nearly one hour over the next hour despite a few emails via Mobile Data. A few hours later, with the Prolonged mode (WiFi and Mobile Data OFF), there were very impressive results after optimizing. Switching back to my WiFi enabled mode made the usage graph dip a little but I expect plenty of scope for further improvements in battery usage, when I have played around a little more with settings, brightness and different modes. Judging from the capabilities that the free version gave me, I think the Pro version could be a worthwhile investment at around $3. 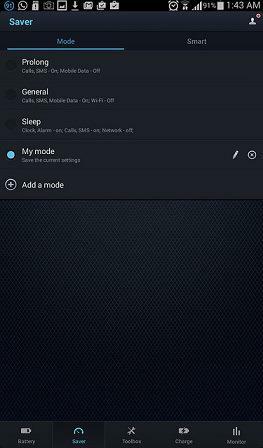 The paid version auto-clears apps running in the background to save more juice, lets you schedule mode change depending on time of day, lowers CPU frequency when the screen is locked etc. Overall, I would recommend the free version of the DU Battery Saver app to anyone who wants to save a few minutes to a few hours of their battery life on each charge and prolong their daily smartphone usability. Optimizing to increase battery life is the core of the free app and it worked for me for the duration of testing, especially when I used it along with the various modes available to save battery life. For more advanced features, the DU Battery Saver Pro should also give you enough functionality and more juice for your money's worth. I'll definitely be unlocking the full features of this app next. How to uninstall unused device drivers in Windows? This article explains how to remove the unused or old device drivers that are available in your Windows operating system which degrades the performance of system. Do you feel your laptop is getting very hot? Learn how to check the temperature of your CPU and take steps to keep it cool. Battery life is something everyone like to improve and DU battery saver seems to appear good. There are many battery doctors available in the Google play station and need to look at this specific App too. Thank you for your detailed review. Suresh the DU Battery saver is definitely good. 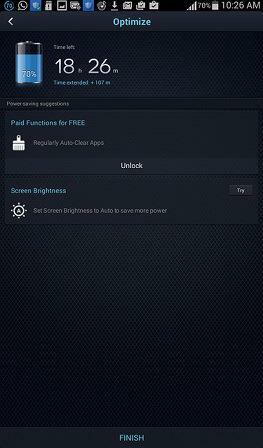 I will recommend it to everyone who wants the battery life extended on their mobile device. It delivers what it promises, and that is a good start. I am using it and this review is based on my personal experience. I am glad I reviewed this product; for, I now have no issues of the battery running out on me.